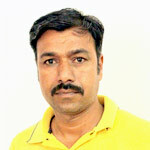 He has been associated with Setu Abhiyan since last 17 years and playing role of social worker. 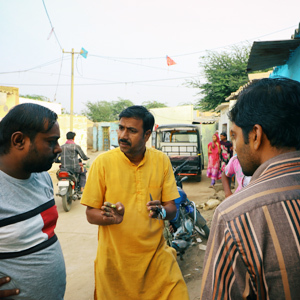 Since last seven years, he has been working for decentralised governance, people participation in governance and decentralised urban planning in the city of Bhuj. Urban local bodies are generally extremely inefficient in our country. They don’t have the powers they deserve even over their land or finances; they are understaffed and corrupt; information and planning is dictated by the state and centre; citizens only complainant and are unable to govern even their own services. The poor in slums hardly get their entitlements and were last to get basic services, if at all. As a citizen with roots in my village, I realized Gram Panchayats (Village Local Bodies) had a culture of participation, planning, and management far more evolved than our cities! I realized that the only hope for better management was to decentralize and have citizens take responsibility for their own development and making Municipal bodies accountable. The powers vested by the 74th Amendment to the Constitution allowed this, however, very few were even aware of this in the city. I decided to begin with the poorest and most neglected areas of my city, Ward No. 2 and 3. When we started working in the city, there was hardly any information available on these wards that would help in physical and socio-economic planning and decision-making. The team of Setu has been helping me organize the citizens and formalize a range of programs to give better control and management over their lives. 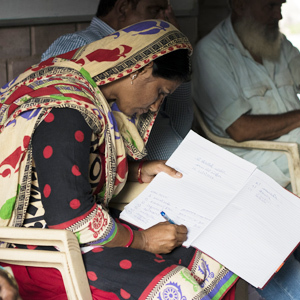 The team of Setu has been helping me organise the citizens and formalise a range of programs to give better control and management over their lives. Taking the experience to Ward No. 4, 7, 10 and 11. In the past few decades, it has been continuously realizing that deepening democratic governance is of paramount importance to address the problems of poverty, marginalization and injustice in the society. Decentralised governance encompasses effective and efficient delivery of services to citizens and emphasis participation and civic engagement in policy formulation, planning, resource allocation and utilisation, and service delivery performance. The 74th Amendment to the Constitution proves a comprehensive structure for urban local government institutions. The constitutional status of municipalities enables them to function as institution of self-government. Participation of the people in local governments is an important objective of this amendment for instance the ward committees in towns and cities ensure proximity between the people and their elected representatives by providing a structured platform for addressing the local problems of citizens. Considering importance of decentralisation and decentralised governance, initiatives have been taken for formation of ward and area committees in different wards having balanced gender representation with the support of citizens. Ward committees would have their office in the ward and committee would prepare development plans for social, economic and physical development of the ward. Bhuj Municipal area is administratively divided in 11 wards. However, initially ward and area committees have been formed in Ward No. 2 and 3 by Urban Setu. 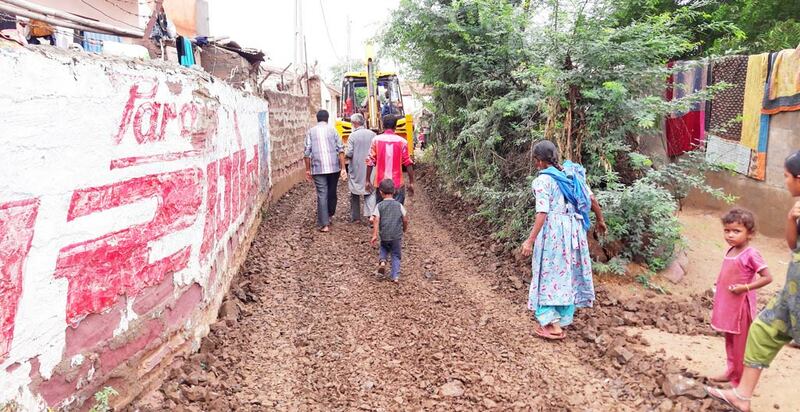 A large number, about 80 percent of population resides in informal settlements having insufficient access to basic amenities and services in these two wards were one of the prominent reasons for taking these two wards for pilots. Even, considerable numbers of families were not enrolled under social security schemes, therefore, deprived from getting benefits of schemes meant for them. Therefore, with the support of Urban Setu, Ward Committee has been formed for Ward No. 2 that comprises 43 areas having population of 16852 (4003 households). The similar structure has also been formed for Ward No. 3 that has population of 12722. The number of Ward Committee members in Ward No. 2 and 3 are 13 and 15 respectively. ‘MahitiMitra’ (Information Centre) has been set-up as a kiosk enabling easy access to information on Government Resolutions and entitlements for the citizens. To enable Ward Committee to take up minor but essential development works in Ward No. 3, a flexible fund of Rs.58,700 as governance fund was provided by SetuAbhiyan to the Ward Committee. This fellowship has laid down steps to form Ward Committee and Area Committee based on its experience in Ward No. 2 & 3 and published it in the form of booklet so that other municipalities or voluntary organizations could refer it while forming WC and AC in their cities. Computerised household map based data base has been created first time for Ward No. 2. This online UPSS data base is regularly updated and can be accessed by anyone for planning and other purposes. About 80% of the citizens have received Aadhar Cards, Ward committees coordinated with concerned departments to provide other entitlements to the citizens. Ward plan with budget was prepared for the financial year, 2016-17 for Ward No. 2 and 3. This was officially submitted to the Municipality. A large number of proposed works have been considered by the Municipality. During the last two financial years i.e. 2015-16 & 2016-17, BMC has sanctioned the work amounting INR9.08 million in Ward No. 2 & 3 as per the proposals made by the Ward Committee in the Ward Plan. The quality of all implemented works, including construction of pipeline for water supply, roads, sewage network, school, toilets have improved because of close monitoring by the Ward Committee. Ward Committees with the financial support from governance funds, executed various development works such as laying down water supply lines, parapet in a school, placement of dustbins, streetlights and information boards at various sites in their ward within a year worth Rs. 1,31,114 with the community contribution of Rs. 72,414. The ratio of community contribution against governance fund was 45:55. -The Municipality has decided to follow the same procedure for setting-up four more Ward Offices in Ward No. 4, 7, 10 & 11. Series of training were organized for newly elected Ward Councillors and Ward Committee Members to build their perspectives on their role and responsibilities for their ward and the city. Provisions of 74th Constitution Amendment Act – the meaning of decentralization and decentralized governance; functions of municipalities as per Municipal Act, Formation of Ward Committees its functions and powers, etc. The idea was to train councilors so that they could understand their role and responsibilities, and powers assigned to them for development of their ward. This training ultimately helped them to work more efficiently for development of the city. The training were attended by 27 Councillors and 18 Ward Committee members. Regular monthly meetings of Ward Committees take place at Ward Offices to discuss and review major issues pertaining to their wards. Ward Committees meetings to discuss and prepare development plans including financial plans for a socioeconomic and physical development of the wards. Ward offices are used as a platform where citizen approach their elected councilors, ward representatives of ward committees and municipal staff to register their complaints as well as suggestions for the development of the ward. Ward offices also provide information about various government sponsored schemes for the welfare of disadvantaged families and facilitate them to access benefits under these schemes. Facilitate Bhuj Municipality to form ward committees in remaining wards of the City. Close follow up and coordination with Ward Councillors and Municipal Officials will be made to achieve the same. Facilitate Ward Committees to prepare ward plans and budgets for socioeconomic and physical development of their wards. 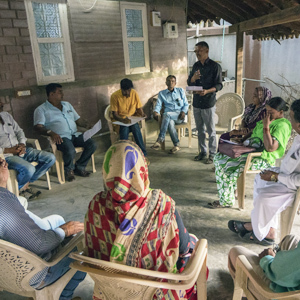 Help Bhuj Municipality to set up Ward offices in each ward so as to ensure participatory planning and decision-making processes, accountable public service delivery, and bring transparency through financial disclosures. Dialogues with Municipality to start property tax collection through its ward offices in order to increase property tax collection by the Municipality. Bhagatwadi, an informal settlement in Ward No. 3, comprising of 35 households from the devipujak community were derived from individual water supply connections since decades. Hence, families were fetching water from away places. In absence of distribution network in the area, Bhuj municipality provides water through tankers on intermittent supply. In January 2015, soon after the Ward Committee formed in this Ward, the issue came to a notice of the ward committee during its initial dialogues with area committees to understand the status of basic services in the ward. 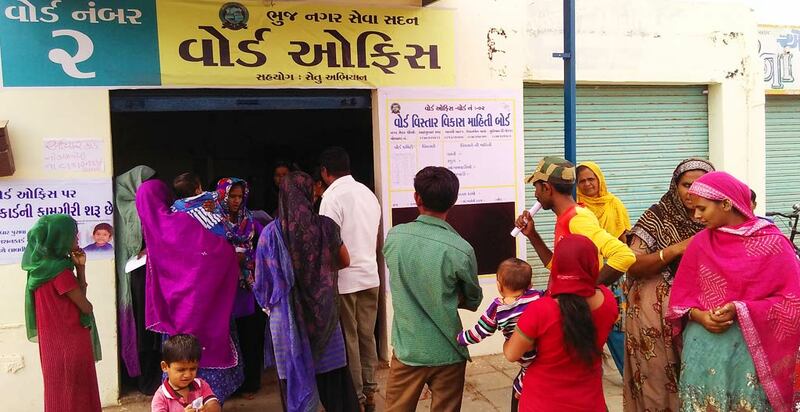 In order to resolve the same, Ward Committee started the dialogue between households and Bhuj Municipality (BNP). As a result of continuous follow-up, on one hand, Ward Committee convinced the Municipality to sanction them a legal connection and on the other hand convinced households to pay tax and charges for getting the legal water connection. Though BNP was ready to sanction legal connection to residents but was unable to allocate funds to extend pipeline to connect individual houses from the main pipeline. Hence, Ward Committee arranged the total amount of Rs. 64,500 from various sources – Rs. 1300 from 28 households (total 35 households were connected with water supply line but 7 households were unable to contribute due to poor financial condition), Rs. 9,000 under Urban Governance Fund (UGF) by Setu Abhiyan and rest of the amount was supported by Save Our Source (SOS) Organisation – and executed the work. 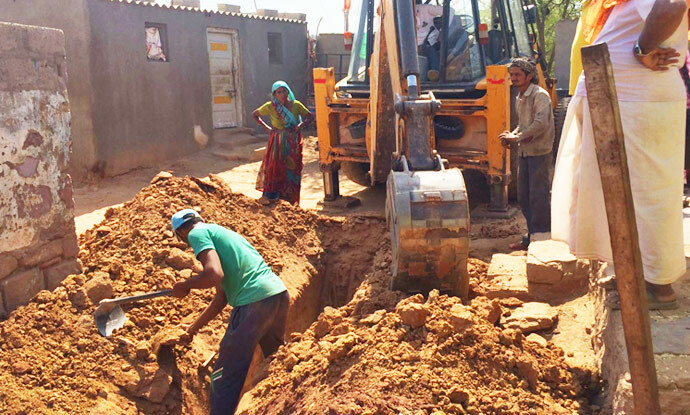 Presently, due to efforts of Ward Committee with the cooperation of Bhuj Municipality, Civil Society Organisations and residents of Bhagatwadi, these households got legal water connection and now accessing water as other citizens of the city.